Just black jerseys. Most likely it'll be White or Purple pants. Harbaugh is against uniform combinations that actually look good. We need a big game from the last General remaining from an era long gone. Yeah now would be a great time for Suggs to have another patented game, but we also need someone like Z or Judon to step up in Tim Williams' likely absence because if we have to rely solely on aging Suggs who is likely going to get heavily focused, it's not going to end well. Really surprised to see Marlon back. Was expecting the worst with his injury, whenever the team goes stealth on an injury it usually ends up being horrible. So that's great news. I mean he's the best player on our Defense right? Didn't Collins deal with a Toe/Foot injury last year? That Irish dancing is jamming the boy up. He needs to chill . A solid prediction would be LJ8 seeing his highest touch total of the season this Sunday. We need the juice, Belee Dat. Offense: 1) Yanda 2) Yanda with one arm 3) John Brown? The formula here when determining who our best player is, is that it's whoever is injured that week. Brandon Williams? Best player on the D.
CJ Mosley? Best player on the D.
Jimmy Smith? Best player on the D.
Marlon Humphrey? Best player on the D.
1. Terrell Suggs: Great run stopper, good pass rusher, quality coverage backer, and clutch gene. 2. Marlon Humphrey: Elite run support/tackler, good cover corner, good zone cover, good hands, and clutch gene. 3. Brandon Williams/Michael Pierce: They’re basically the same player. Williams absense last season was more noticeable however. Both provide elite run clog ability. I'm sure Flacco is super scared...Yawn. With Marlon presumably back, this game shouldn't look all that different compared to the last one. Frankly I'm more concerned about the Bengals game after our bye. No Payton & Brees to out execute us. No Newton & McCaffrey and their off script plays/versatility. I'm sure their WRs will make a couple plays just like last game, but it won't be enough this time either. Horrible situation to be in, but I'd be more worried if we were actually playing a good defense. We can 6-7-8-9 these scrubs up and down the field with Snead, Andrews, Hurst, and Crabtree. John Brown wrecked them last game and they'll give him extra attention. They don't have good EDGE pieces and all of their interior players are overrated. 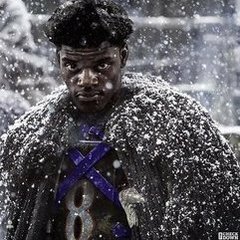 Double down on the Lamar Jackson predictions, he's going to get a lot of work in this one. So...no pass rush and no blind side protection for Joe. Gonna be a fun game to watch.